Wildlife questions Where have the blackbirds gone!! Robin fledgling left on his own in the dark! Where have the blackbirds gone!! Can anyone tell me where my two blackbirds have disapeared to. I had a female who visited my garden several times a day which i could get quite close to and give her worms out of my hand, and a male very young blackbird. Now they have both disappeared, any ideas???? HI, this post and link to Ian H's blog should answer your question. They have finished with family duties and will have gone into quiet parts of the countryside to recover,stock up on the abundance of natural food and grow their posh new plumage,they will be back. Busy moulting! 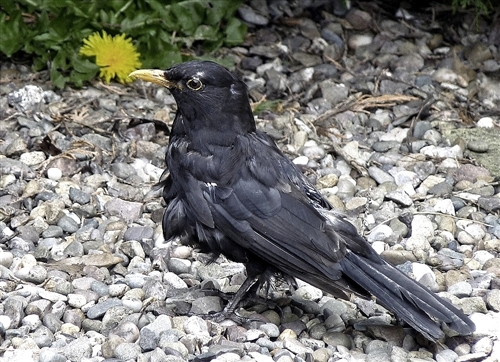 I have a friend in Tasmania with a pet blackbird who disappears into a cardboard box, only popping out occasionally to eat, while he moults his new feathers. Think they have found that lots of Blackbirds move south for winter with lots of those in south of country going to france. And then we will get our winter visiting Blackbirds from the continent when the weather turns very cold. Well this scruffy chap decided to stay in my garden to have his moult.!!! Have you ever seen anything like it!!!!! Certainly having a bad hair (or feather) day. Hi Julie, yes they're all away at the moment but they'll be back.